That’s a message I try to communicate to my students all year, but this morning I am congratulating hubby and I on our success with bees this year. The bees we rescued last week are doing quite well, as are a few of their buddies. When we took the comb out of the floor cavity, we separated comb with brood from comb with just honey, so we ended up with quite a bit of honey and nectar in the brood-tote. Sunday evening, we put the brood tote in the greenhouse so that we could open the lid to let the bees out without having bees drown once it started raining. Even after 4 full days, there is still a lot of nectar in that comb. The bees are mobbing this buffet of ready-made food! I took the comb from the top, which has been almost completely cleaned up, and put in on our garden cart. (Ignore the date on the picture — we had to resort back to our old camera and I forget the set the date!) The bees now have access from above and below and can continue pulling honey and nectar out to store in their own hives. There are still some cleaning up the tote in the greenhouse — as long as nothing starts to smell bad, we’ll let them retrieve what they can and then melt the wax down. The hives we created from the rescued bees are also doing well. I still didn’t see the queen this morning, but we had one NUC from a previous split that had 12 queen cells! We were able to put a frame of brood with a queen cell into two of the rescue NUCs and still leave 8 cells in their “home” NUC. I’d love to cut some of those cells out and create more splits, but we need to move some NUCs to out yards or the farm first. The third NUC from the rescue is a little weak, so we’ll hold off on putting a queen cell in there. They may move to one of the other, more viable, hives. If not, we’ll help them along with some more brood from elsewhere next weekend. All other recent splits have evidence of a queen (new brood), but I didn’t see a queen in any of them. I was moving quickly through them and may have missed the queens or the queens may be out mating again. These are queens that have hatched within the last week, so we’re very happy to see brood. I guess I’ll have to set up new hive benches at the farm as well as check those bees so that we have somewhere to put them all! A neighbor wants us to place some hives in his sunflower plot, so maybe I’ll wait until hubby makes it down to the farm to set up bee benches! Something else that made me happy this morning was the sight of my asparagus plants! I have no idea where I’m going to plant them at the farm yet, but I think I may just drop them in between the sprinklers. We know we won’t be tilling the soil there and I don’t know that we’ll get the actual garden set up this summer with everything else we need to do. We won’t be able to harvest asparagus for at least two years, so I want to get them in the ground somewhere this year! Who knew that asparagus looks like little pine trees when it’s not in the grocery store? Apparently the plants can end up 5 feet tall! Maybe I’ll plant them behind the lavender and use them as a screen to block the view from the road! 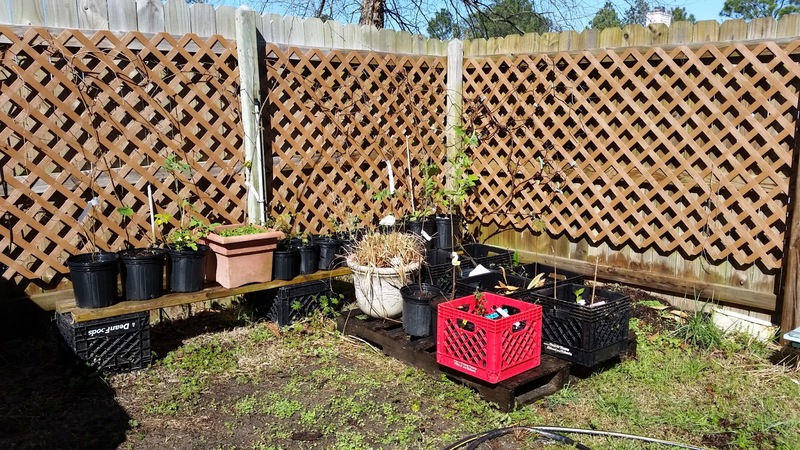 Trees and shrubs – protected from the dog with milk crates! As it was already 97 degrees in the greenhouse by 9:00 a.m. this morning, I decided to move our trees that are awaiting planting to their outside spot under the sprinklers. All too often, I forget to open the greenhouse windows in the morning, so the poor plants end up baking — now that we’re back to dark mornings, that’s been more of a problem this past week. So, I managed to put off grading for an hour or so while I played with plants, potted the blue-berry bush I bought yesterday, and started some trays of tomatoes and peppers. I honestly planned to get comfortable and grade after that, but when I took the trash out I found a box of trees from Arbor Day on the front step. We didn’t receive our entire order, but there was enough planting to do for me to postpone grading another hour. Then I ate lunch. Now I’m blogging! Yes, it’s that time of the year when it’s hard to stay indoors. It’s neither too hot nor too cold outside. It seems that every day another variety of daffodil blooms in my garden. The bees are buzzing contentedly and the grumpy ones are 270 miles away at the farm! I do love teaching, but it’s also the time of year when I am just tired of reading essays! Spring break is late this year, and most of our spring days-off became inclement weather make-up days for the third year in a row. Students are ready for spring break. Teachers are ready for spring break. We are knee-deep in state mandated standardized testing, and I just want to take the dog for a long walk. But enough complaining. The trees and shrubs we received so far this year from Arbor Day have really good root systems, unlike some of what was shipped last year. The Catalpa and Red Maple trees are a good height and I actually had enough potting soil at home to plant them all. The arrival of this box is a reminder to grab another bag of potting soil next time we’re at Lowe’s, and my Lemon Grass and Mandevilla both survived winter in the greenhouse. The Mandevilla is even blooming already. The two varieties of Chocolate Vine on the arbor are filling the yard with a jasmine-like scent, and spring break is only three weeks away. As always, life is good. We were so excited to fill the bed of the truck with daylillies that I split last fall, a couple of magnolia seedlings, and six golden raintrees that were all jammed into one pot. However, after digging the fifth hole in the packed Georgia clay, “How exciting” turned to “What were you thinking?” I dug a couple more holes by hand while waiting for hubby to return from Tractor Supply and then had him use the auger to turn the soil for the remaining plants. I guess I could have used the tractor myself, but I haven’t been on it since November and I’ve never used the auger, so I wasn’t comfortable experimenting without supervision and the encouragement that hubby and BIL always provide. I ended up planting over 40 plants, some of which you can see here, and all were doing well on Wednesday when I last saw them. I’m sitting here typing at 2:00 a.m. hoping that the storm that woke me up hasn’t washed them all down to the creek! Hubby installed fence pickets and H-braces on Wednesday while I shopped and then wandered around the woods looking for cedar and dogwood trees to save. 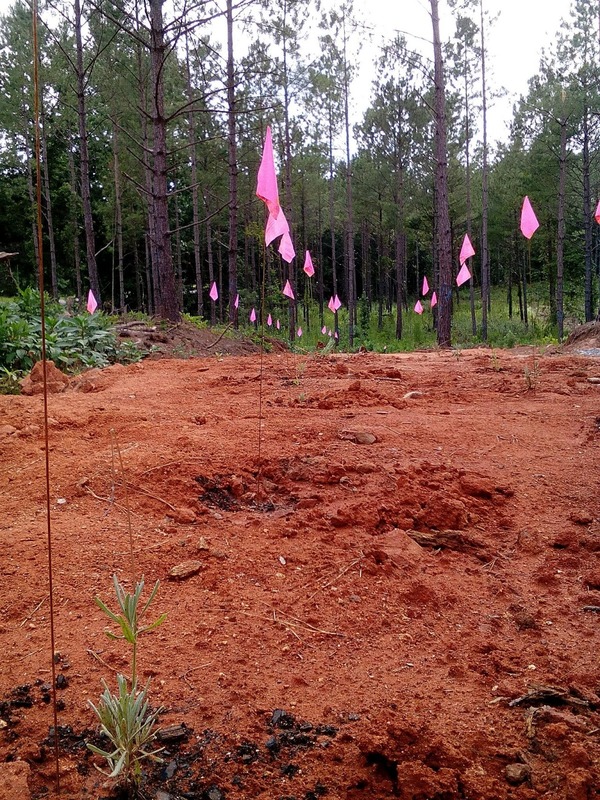 Some had been knocked over during the tree thinning while others were covered in vines. Now, I love Carolina Jessamine, but I love dogwoods more. Then there are the spiny vines that not even their own mother could love — they just have to go regardless of what they are! They’ve been tangling themselves around my feet, snagging my boot laces, and scratching me for long enough and I’ve declared all-out war on them. Yesterday was hubby’s bee-check day, and I stuck around BIL’s farm, hung out with the dog and graded essays. 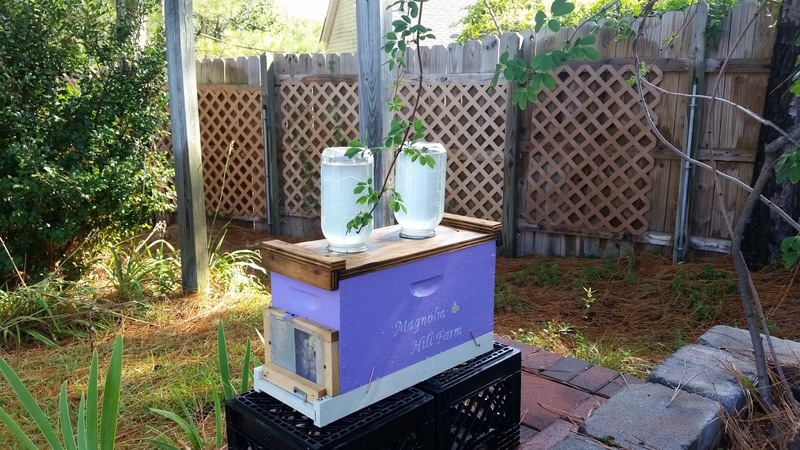 Back in South Carolina, our new bees and our old hives are thriving, and our trees from Arbor Day are sprouting leaves. Of course, with the memory of the 40+ plants planted this week, I don’t even want to think about the 43 trees from Arbor Day, the 25+ golden raintree seedlings, or the 15 magnolia seedlings that will all have to be dug in this fall — at least not until the memory of just how hard the soil is here fades a little! My husband went to a class about producing queen bees on Saturday, and came back talking about a queen castle. Of course, I had no idea what he was talking about, but now I do. 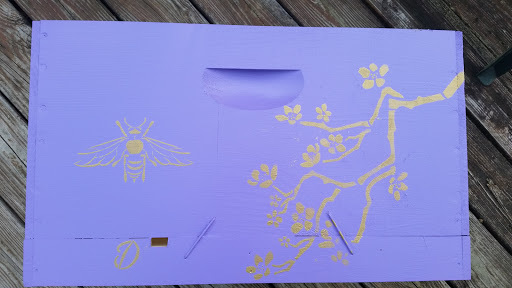 A queen castle is an oversized bee box with entries on every side. There are slots on the inside that allow you to divide the box into four segments, each of which is accessible from a separate entrance. It’s probably a whole lot easier to look at the picture from the link above than to follow anything I might describe! I’d show you the inside, but I forgot to take a picture before we put it in use. As this is a queen castle, I wanted to paint it in a way that was fit for a queen — or for multiple queens. For me that meant gold paint. 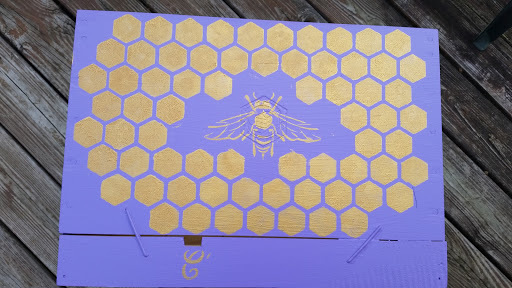 I really like the way all four sides turned out, but the design with the honeycomb is definitely impractical for frequent use. I love it, but I used an entire tube of paint and it took far more time than I really had to spend on it. Still, it stands out and it was both fun and relaxing. We decided to label each entry to make talking about what’s going on with each section a little easier. Now that we have pretty much everything painted for this year, we’ve decided to color code the boxes when we add or repaint, also to make communication clearer and easier. 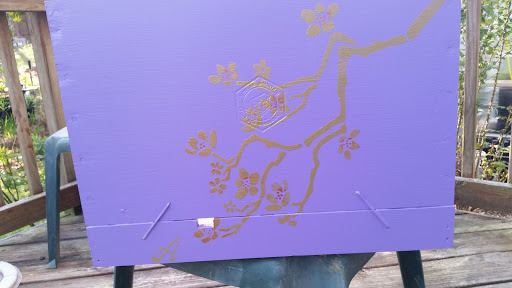 The first of the new bees will be here Saturday evening, and hubby is out setting up hives at new locations that are still close enough to home for us to maintain them, but far enough away to minimize competition for resources. We’ll need to drive back and forth from the farm and home next week so that we can keep checking on the new-bees. It would have been a little easier had they arrived on their original due date, but nature has its own time table and we are learning to be flexible. 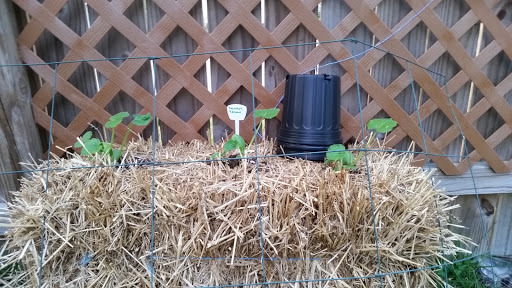 Another thing we are trying this year is planting vegetables in straw bales. If this works, we’ll plant our first veggies at the farm this way. We may even try moving these bales to the farm at some point, but I suspect that will be impractical. It will take us a while to soften up the packed clay and condition the soil on our future garden plot, and this appears to be a solution. 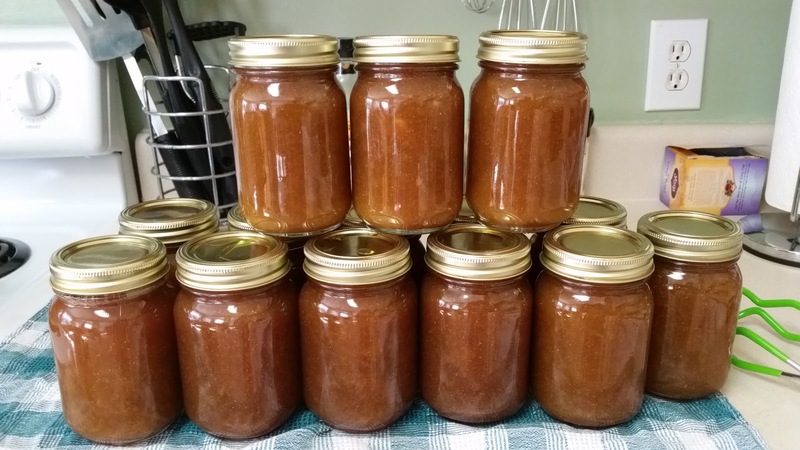 I don’t want to go a entire summer without fresh tomatoes, peppers, or squash, especially now that I know how easy it is to make and can salsa! 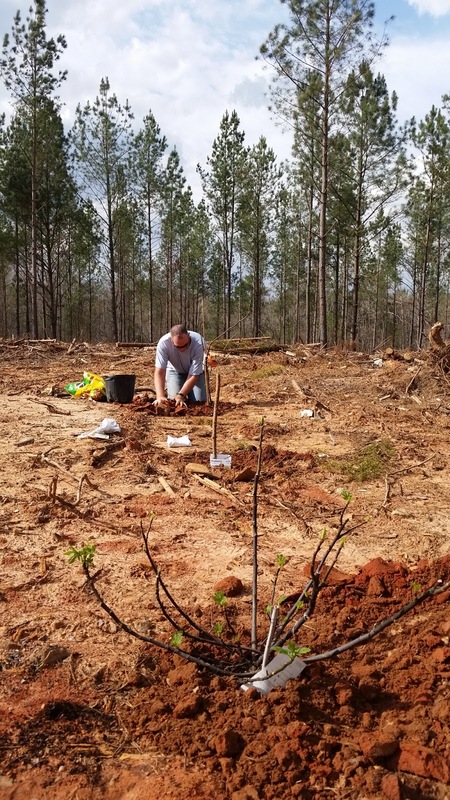 Last week was also the week that our 43 trees arrived from Arbor Day, so I spent two evenings planting trees in pots and setting them up where they will get enough sun and plenty of water from the sprinklers. 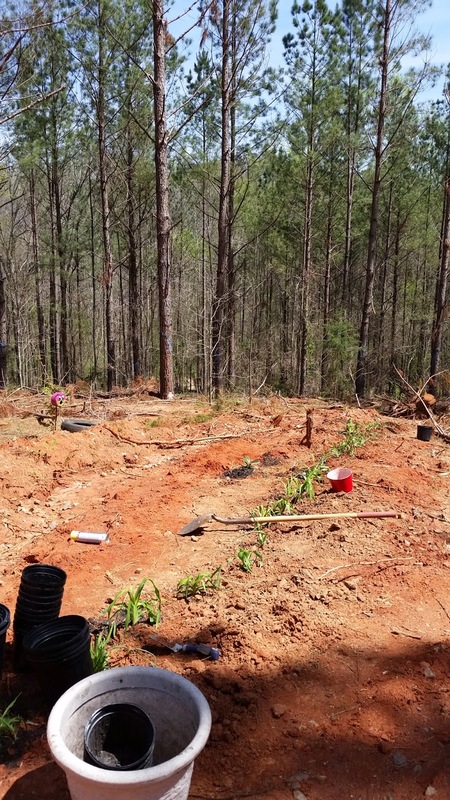 The daylillies are burgeoning and the trees I am growing from seed are still hanging in there, although my tomato seedlings are currently bigger than my magnolia seedlings. In retrospect, having to make multiple trips to and from the farm is not such a bad thing as we are rapidly running out of space to store all the things that are sooner or later heading south! We planted two gardenias by the gate in November, but this weekend we started our orchard with two fig trees we received as a gift and two blueberry bushes. The fig trees did great in the greenhouse over winter and we moved them outside a couple of weeks ago. The first leaves opened at the start of this week, so this was a good time to get them in the ground. The roots were less pot-bound than we thought and there was a good soaking rain overnight. I think they will do well. We are so looking forward to adding the trees we ordered from Arbor Day Foundation — hopefully over spring break. Our plans for the house change from minute to minute, but we know where the RV will go and we plan to watch the woods go through the seasons from there before we make a final decision on the house. Every time we visit the farm, we see reasons to place the house in one place, then another, then another….. It will all work out in time. We cooked supper and breakfast in the RV and had my brother-in-law (BIL) over for both meals, which was fun, even if I clearly don’t yet have the oven figured out. It didn’t help that I thought I heard BIL yell yesterday while he was using the table saw (he just sneezed), so I turned the gas burner and oven off and ran to check on him and then couldn’t relight the pilot light on the oven because it was too hot. So much for biscuits… Then I burned the biscuits this morning, so I need to find the middle ground between barely cooked and black next time! As usual, leaving was difficult. Daylight savings time stole one hour of our day, and then we fiddled around doing bee stuff with BIL until 2 hours after our planned departure. It was worth it to see how his hives are growing and then to see a series of beautiful rainbows on the drive back home. Life is good. We have redbud trees in full bloom down by the creek and more surprises to come, I’m sure, in the coming weeks.